phproxy is “dedicated to bringing you fast web browsing from behind web filters”. 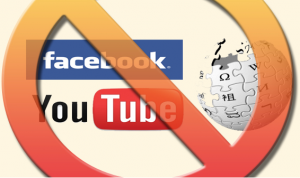 Simply tap in the URL of that banned site you really must see, it could be Facebook, MySpace, Youtube, or a renegade blogger behind enemy lines, and you will be able to access it with no problems. More seriously, the proxy allows you to visit a site anonymously because it is the proxy itself that is visiting the banned site not you, and so keeps your browsing hidden from prying eyes allowing you to protect your online identity. Such a proxy also allows you to visit sites that have banned your IP. This might be a forum or just a website or blog from which you or other users on your IP range (whether on your school or company network or your ISP account) have been barred access. The proxy server is an open gateway between your web destination and you. Other proxies exist, such as www.the-cloak.com (please make sure you include the hyphen in that URL or you will be in for a shock), and this page provides a shipload more. You could use TOR or Freegate to access these sites!